If you are new to golf cart life, you probably have a few questions. And chances are, we’ve heard them before. Below are some answers to some of our customers’ most frequently asked questions. I’m in the market to purchase a golf cart but can’t decide between getting an electric or a gas golf cart. What are the pros and cons of each? Electric golf carts are ideal for those who travel an average of 3-5 hours a day. They are environmentally friendly. New Trojan brand batteries, used in our refurbished golf carts, typically last 3-5 years. Maintenance includes charging them regularly and driving the cart regularly. You will also need an electrical outlet available to use only for the charger and cart. Owners of electric carts will want to fill their batteries with distilled water on a regular basis. Gas golf carts are ideal for those who travel more than five hours a day and drive greater distances on a regular basis. They can generally travel 5-7 days on one full tank of gas. They are not considered environmentally friendly. Gas carts do emit fumes as well as a low rumbling sound. Owners of gas golf carts will want to change the oil in their cart every 6-12 months. What are the benefits of choosing a refurbished EZGO RXV over a brand new one? To begin with, the cost of a refurbished cart is often significantly less than a brand new one. In addition, many customers find that they can get more upgrades and custom options. These custom options will make it feel more like their own and less like their neighbors’ cart. And for less than or equal to the price of an entry-level new golf cart. Our thorough Refurbishing process offers peace of mind to many customers. We include a 6-month warranty with our Used and Refurbished carts. What is involved if I want to special order a custom-designed golf cart? We love helping our customers custom-design their perfect golf cart. We have a simple and streamlined process for choosing the options you’d like on your cart. Paint color(s), seat covers, wheels, electronic upgrades, safety features, are just a few options. See our Custom Refurbished Golf Cart page for more about our options. Depending on what custom options are selected, the build-out process can take anywhere from one to six weeks. 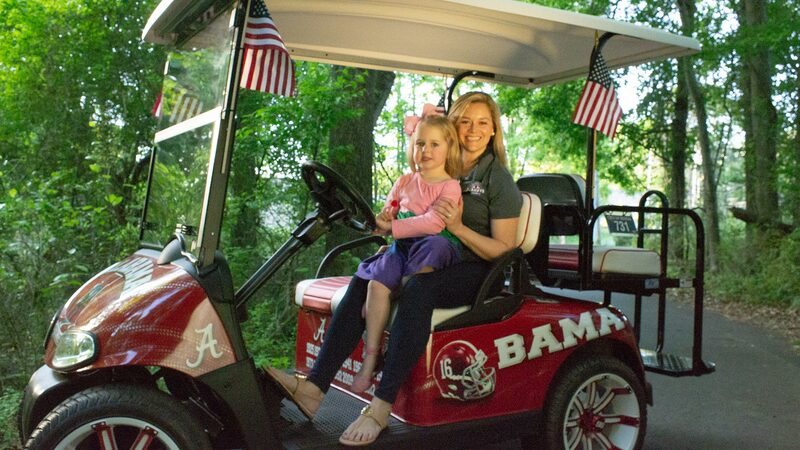 We are proud to have several golf cart financing options through The Southern Credit Union and Lendmark. Visit our financing page for more information. We offer a 6-month limited warranty through Electric Warranty Group (EWG) for the entire golf cart and an 18-month manufacturer’s warranty on the batteries. See more about our Warranties available here. How long and how far can I expect to travel with a fully-charged golf cart? 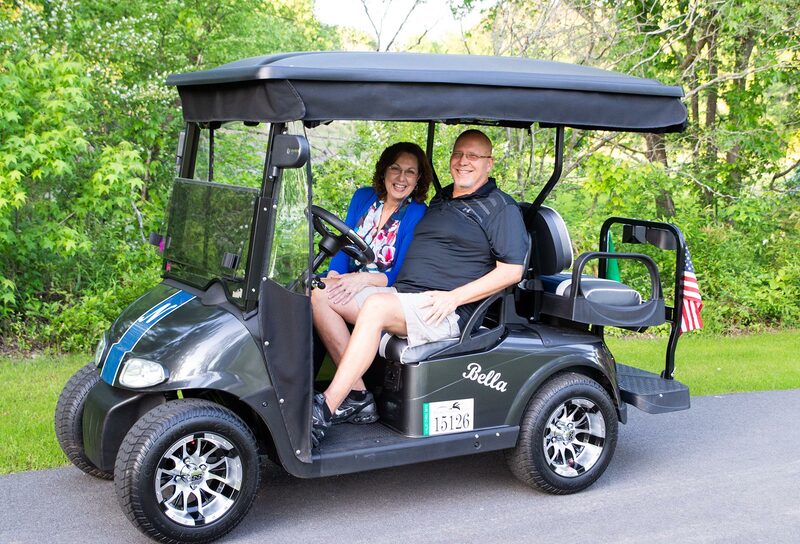 On average, a 48-volt fully charged golf cart can travel 18-22 miles or 4-5 hours. Please note that brand new batteries have what we call a “breaking in” period. They take about 100 charges to reach their full driving range potential. In addition, driving on a lot of hills can lower the distance your golf cart can travel. How long should I expect my new batteries to last? A new set of well-maintained Trojan batteries should last 3-5 years. See our Battery Maintenance page for specific instructions on getting the most life out of your batteries. Should I purchase insurance for my golf cart? Insurance is not required for your golf cart. However, many owners chose to purchase insurance for their golf cart as they would any other vehicle. Rates are $80-150 per year, on average. We are proudly partnered with The Hathaway Family’s Farmers Insurance Agency, the number one Farmers agency in Georgia. For more information or to get a quote, we recommend contacting Tyler Hathaway, agency producer, at 678-701-5010. How fast do the golf carts go? 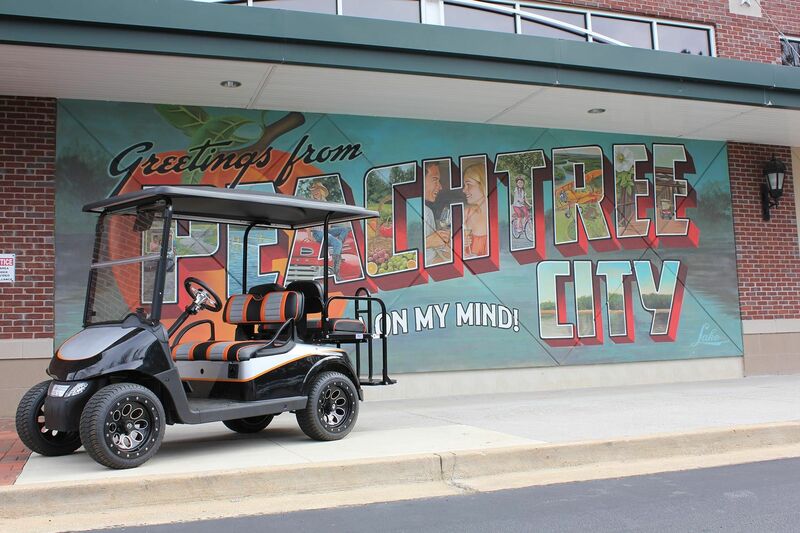 The golf carts are speed-programmed to 19.5MPH, as 20MPH is the speed limit in Peachtree City. How do I register my newly purchased golf cart? In Peachtree City, you’ll need to bring your signed Bill of Sale and $45 to City Hall. They will give you a 3-year permit decal for your golf cart. 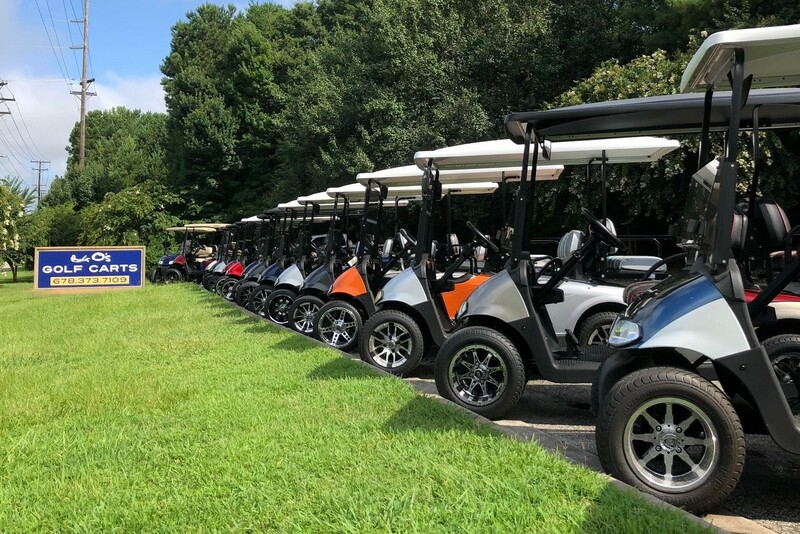 For residents in towns outside of Peachtree City, please contact your local city hall or DMV office to find out about registering your golf cart.